Thank you to Food Should Taste Good for sponsoring this post! Yesterday I prepared a healthy lunch for my 3 and 5 year old. I had also just whipped up this Roasted Pumpkin Hummus and thought I’d have some of that for my lunch. So we all sat down at the table to eat and as soon as they saw me eating this hummus they asked me what it was and asked if they could have some. I told them it was a special and delicious chip dip and they each took one bite. They pushed their plates aside and asked if they could have more. I thought for a moment. Normally my response would be something like “eat your lunch first and you can have some.” But I realized that this nutrition-packed hummus was probably even healthier than their actual lunch – so I consented. And that was the end of my lunch. My kids eagerly huddled around me and absolutely went to town on this! It was one of those times when as a mother you pat yourself on the back. And tomorrow I’m making another batch for them. But this time I’ll be smarter. I’m doubling it. One of the highlights of our snacking session were the chips that accompanied the hummus. 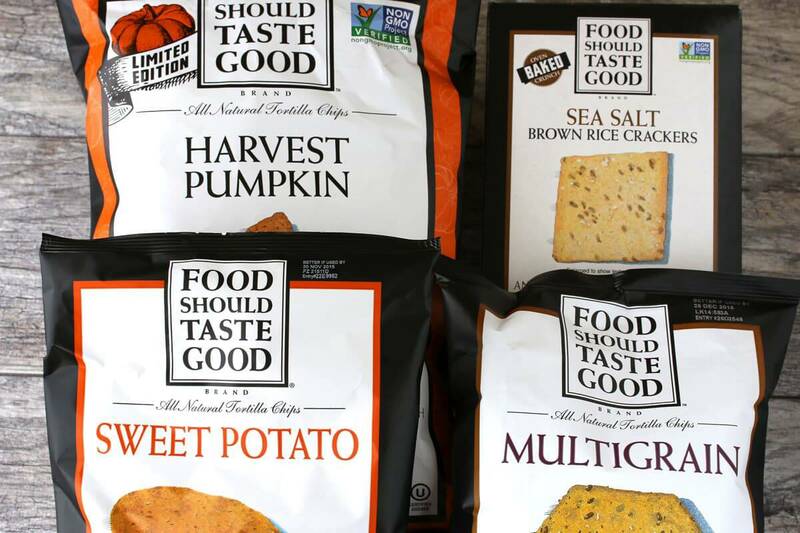 Food Should Taste Good’s chips have become a family favorite and we were excited to try out three flavors that were new to us: Harvest Pumpkin, Sweet Potato, and their Brown Rice Crackers. All three of these paired beautifully with the hummus, including one of our traditional favorites, Multigrain. 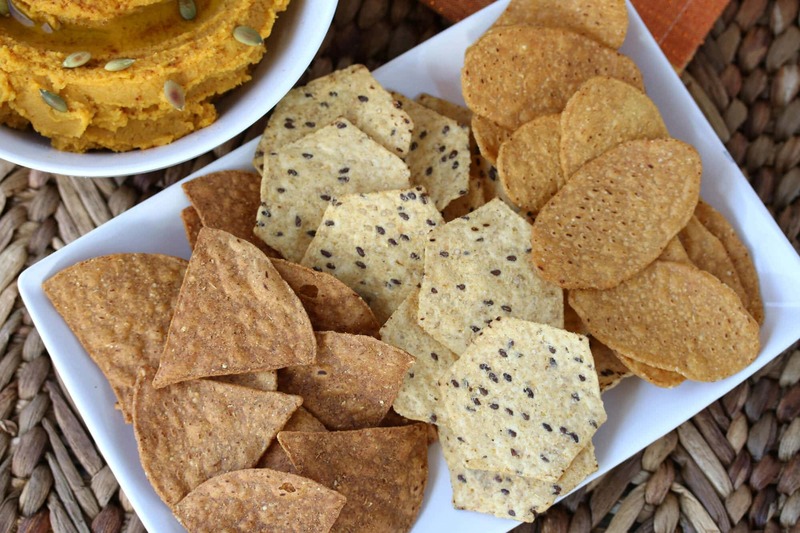 FSTG’s chips are all-natural, certified gluten-free, vegan and kosher. No MSG, no GMO’s and made with simple, wholesome ingredients. My kids knew exactly which ones they wanted. My 5 year old son hoarded the new Pumpkin Harvest chips and my 3 year old daughter opted for her old favorite, Multigrain. I pulled in a third option, Sweet Potato, and before long we were all sharing the different flavors. Somehow, amidst the enjoyment of our hummus and chips, the spirit of peace and harmonious sharing descended upon my kids. I think I may have found the solution: Make and eat hummus all day long. Yes, below are our personality-rich 3 and 5 year old kids. My son used to hide from my camera but in recent months he’s more than eager to pose. And my daughter has followed suit. Yeah, they both really like to ham it up for the pics! But I’m just thrilled that I’ve found another super healthy snack that they’re both willing to eat! 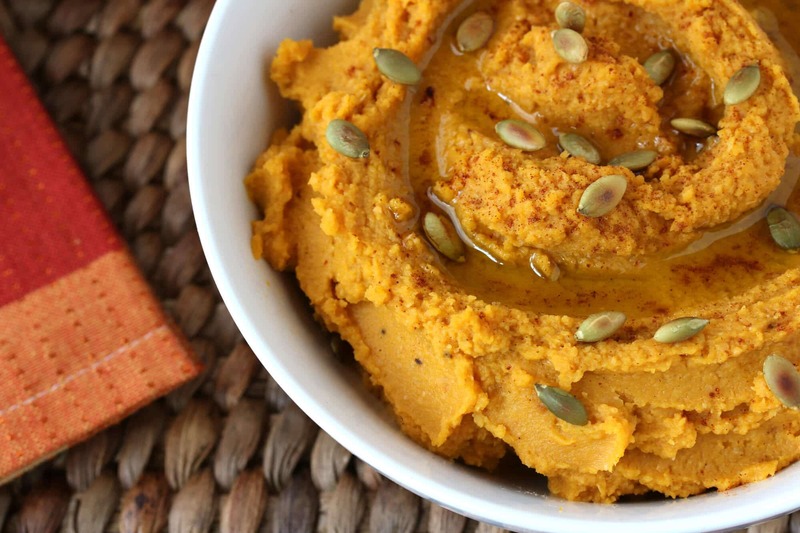 This delicious hummus is packed with nutrition featuring healthy fresh pumpkin, garbanzo beans, garlic and olive oil! And then it’s laced with a few additional flavors to really make it shine! Instead of my usual step-by-step photos, I’ve put together a rockin’ video for you! I’d love your feedback: Do you prefer my usual step-by-step photos or this video-style format? Leave a comment! Thank you! This giveaway has now ended! Congratulations to our two winners, Kristina and Susan! A special “thank you” to Food Should Taste Good for sponsoring this post and making the creation of recipes like this possible! As always, all opinions are 100% my own. I love your “rockin video” – sweet! So easy. 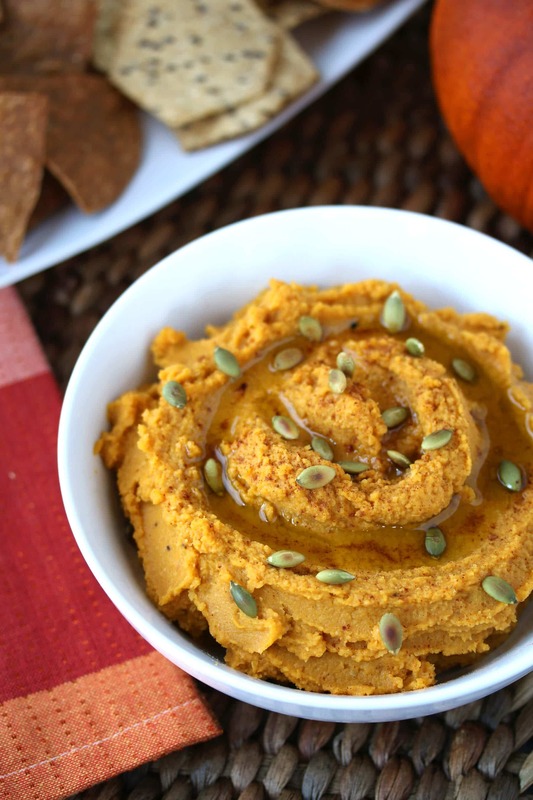 As for the Pumpkin Hummus,it just sounds so yummy. I have roasted squash in the past. It not only tastes great it’s a good for you food, as your children so excitedly showed us. So cute! I have had the chips in the past, they are super. So, I won’t take up the giveaway spot. I just wanted to say “hi” and pass a comment. Thanks for all the treats, surprises and fun. I would love to try any of these healthy chips. Our family is very careful about our eating as my daughter has MS & my son is in Renal Disease. Loved your “Rockin Video.” And we absolutely adore Hummus & will try your recipe tomorrow. I’ve yet to meet a hummus I didn’t like, and this one sounds like it would be right up my alley. Love that beautiful bright orange colour! This hummus looks wonderful, I need to try this! That’s a hard question to answer since they all look so good! Probably sweet potato and the sea salt. And pumpkin! Your hummus looks to die for and the pics of your little ones are soooo cute!! I love this so much. I have made hummus in countless variations, but never with pumpkin. I have to make this. Hummus does rock and I bet this pumpkin one rocks even more!oo and I bet we’d love those Pumpkin Harvest chips!! 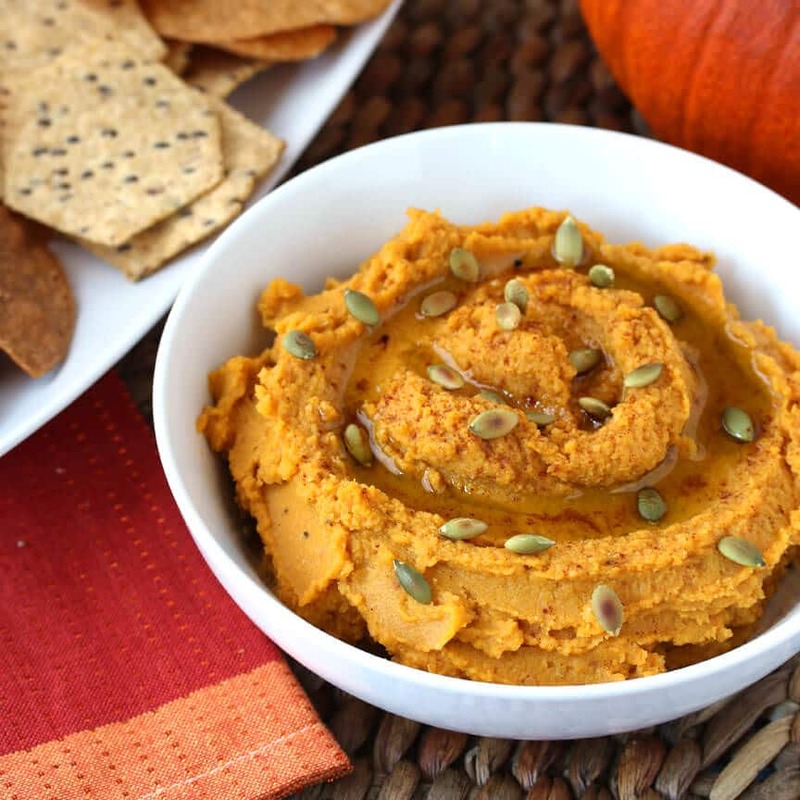 Food Should Taste Good chips are so delicious, and this pumpkin hummus sounds incredibly good! It’s like a match made in heaven! 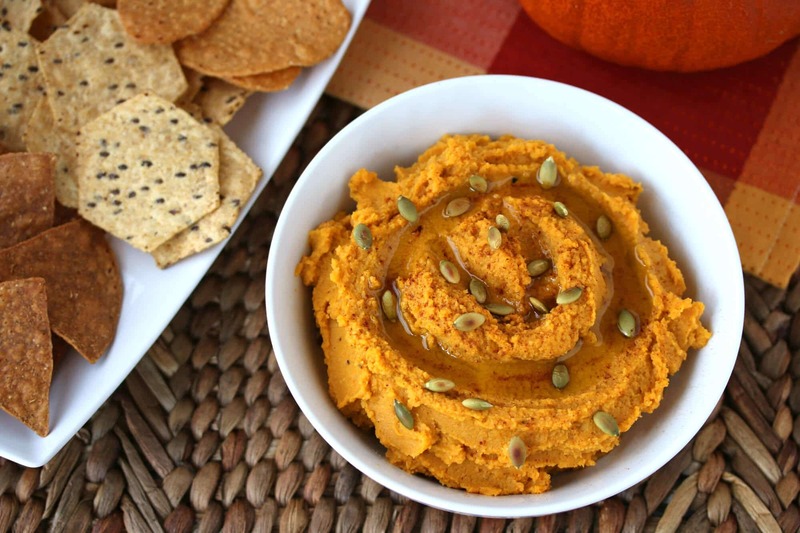 this is great was looking for a new hummus recipe and would not have thought of Pumpkin! What a great idea will be making this and as for the chips love all of them! I like the sweet potato. You know this hummus must be delicious when even picky kids want to eat it all! yay that your kids liked it! And yes have had those chips before and looove them!! I admit it, the pumpkin chips have caught my eye. I love that they are likely not sweet like so many other pumpkin-themed items this time of year, and would be amazing with several dips–including this awesome one! Ooo, I love all of their flavors, but I think I’d have to jump at the pumpkin chips. I love that they would be such a great accompaniment to the hummus! My favorite way to eat chips is as a snack, usually with salsa or cheese dip. My favorite variety is the sweet potato flavor. Beautiful! This reminds me of a sweet potato hummus I made last year with Thanksgiving leftovers – it was really delicious. Yours looks even better with those pepitas on top! Those are some smart kids – I don’t blame them one bit, it looks fabulous! I love hummus and I love roasted pumpkin, so I know I’d love them combined. Hummus was my super sneaky healthy lunch when I had two toddlers. They would gobble it up with sugar snap peas and multigrain crackers. Now they love Food Should Taste Good’s multigrain chips. 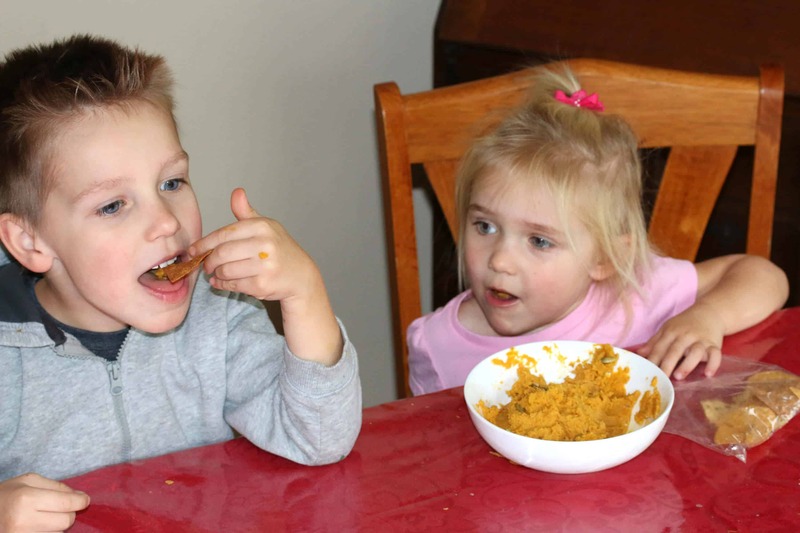 I’m sure they’d like this pumpkin hummus, too. My son would want to eat this for his lunch too, he loves anything with pumpkin. And I lvoe those sweet potato chips, they are so good! Okay that is just awesome. Wouldn’t have thought to try a pumpkin hummus but I’m all into it! I want to shove my whole face in this. But then I’d miss out on all those delicious chips. So I’ll just dunk right into this fabulous hummus with those tasty chip. You know if the little ones like it, then it has to be good! My kids are big hummus eaters too and I bet they would love this version! Ooh, those chips are favorites of mine! And I think your pumpkin hummus dip will go great with them! Yuuummm, I just love FSTG chips and this dip looks delicious!! This hummus is perfect for the holiday table! I’m allergic to tahini but I think I could easily substitute cashew butter. I’d love to have pumpkin and sweet potato! This hummus rocks! Can’t wait to try this! Love this and hummus is so good as an app for the kids!! We love everything pumpkin in our house! and we love it even more if it’s a quick and easy snack! Wow, what a fantastic idea! Love it! Such a great idea and I LOVE those chips! They are the bomb! I love hummus but I’ve never tried making it myself! This looks delicious! I love chips and salsa, and I would try the Sweet Potato first. I like a good spinach dip with my chips. I am excited to try the sweet potato chips! I love guacamole with chips. I would love to try the Multigrain FSTG chips. This hummus looks beautiful!! I bet it’s tasty too!! I like to enjoy chips with salsa. I’d love to try the Sweet Potato flavor! I actually like to enjoy chips just plain….but with salsa would be my second! The pumpkin flavor would be my first try! I love chips with salsa and I want to try the sweet potato tortilla chips. I would so dip the HECK out of this hummus. Looks super tasty. Especially with those pumpkin chips. Wow!! The color, the pepitas, the flavors. I LOVE this! Pinning! You’re so lucky that your kids were willing to eat this! My daughter would have turned her nose up at it even though she’s a traditional hummus fan. Personally, I think it looks AMAZING! 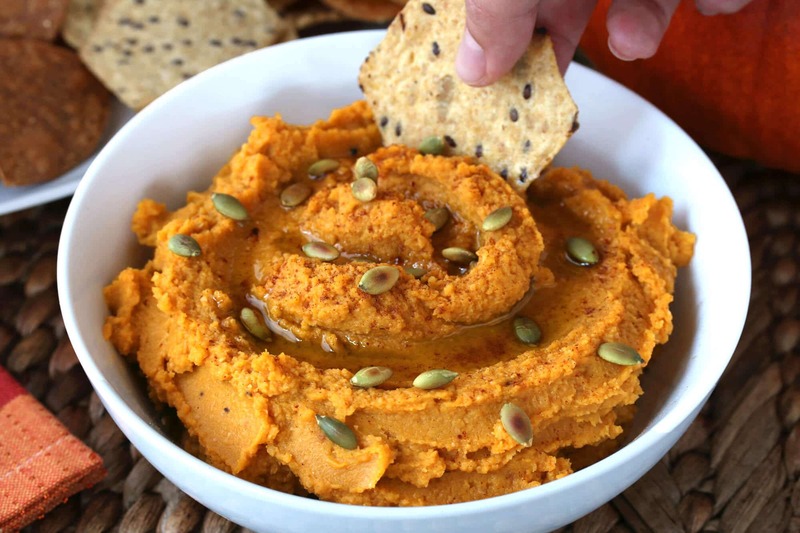 Oh wow so healthy, I have never thought of making pumpkin hummus before. What a great idea! Looks like the little ones enjoyed it a lot! What a beautiful, flavorful, dreamy hummus! Love the colors and garnish of seeds on top. Mmm. This hummus sounds awesome! I enjoy eating chips straight from the bag (if they’re good chips like FSTG) and with a variety of dips. Multi-grain has been my go-to for a while but I love all of their flavors. Haven’t tried the pumpkin and would like to! Where are the crackers? I’m ready to chow down! I want to try sweet potato and my favorite way to enjoy chips is with salsa. I like chips with any kind of dip. I want to try the FSTG Cantina Chips. I know this is about 2 years old, but how much is the yield? Seems like a huge serving size if it serves 4 but has about a pound of beans and a pound of pumpkin in it. Either way- looking forward to making it for Thanksgiving apps! Hi Liz, yes, 4 servings definitely makes for very large servings, doesn’t it! That should be 6+ servings, depending on how large the servings are. I tried to find my original hand-written notes for this to see what the quantity is but can’t find it. If you make it and don’t mind reporting back on the yield, I’d appreciate it!